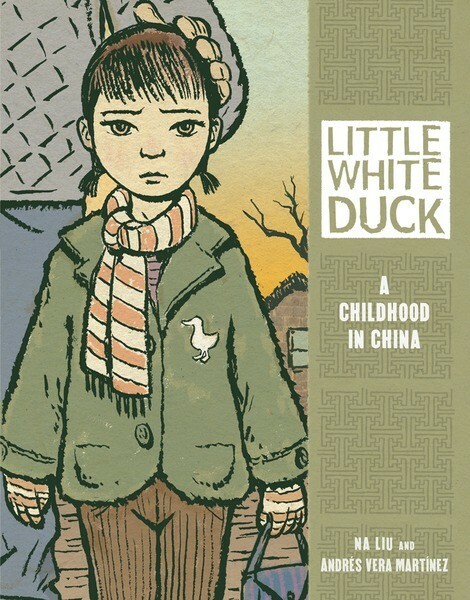 Na Liu and Andrés Vera Martínez's Little White Duck: A Childhood in China (Graphic Universe, 2012) is a memoir in graphic narrative form about Na Liu's childhood in Wuhan in Hubei Province in China in the late 1970s. The illustrator is Liu's husband. As Liu puts it, her childhood coincided with a particular moment in China's modern history, when the closed world of Mao's China, with its revolutionary politics and intent to erase class hierarchies as well as various traditions, began to transform with increased connections with other parts of the world and global changes in political, economic, social, and technological systems. Her parents lived through the sweeping changes of Mao's regime and a country-wide famine. In contrast, Liu and her sister grew up in a rapidly urbanizing area and lived in more comfort than her cousins who were still in rural areas. The memoir unfolds in a series of short vignettes from her childhood, from the day Liu learns about Chairman Mao's death to her creative plans to catch rats with her sister (for the country's goals of ridding areas of pests like rats, cockroaches, flies, and mosquitoes). In one vignette, she goes with her father to visit his mother (her grandmother) in the rural village where he grew up. She turns out to be a very mean-spirited old lady, and Liu spends the day outside with her cousins and other village children. She learns in that experience that people in China are still living in great poverty when the children are fascinated by her clean and well-made new coat on which her other grandmother had sewn a little white duck made of velvet. One thing I found interesting was that Liu's memories of China and her childhood are sometimes deceptively simple (or politics-free), but there is a lot of information woven into the stories about the state of China at the time. For instance, in the story about how she planned with her sister how to catch rats for the country (school teachers assigned children the task of bringing her two rats' tails as part of the pest eradication program), the fact that schools were essentially conscripting children into a program to control the pest program suggests other issues. The memoir gives a quick note about how the sparrow, for instance, used to be on the list of pests that children were to help kill, but then when people did kill off sparrows in large numbers, they ended up upsetting the ecological balance, and the insect population skyrocketed and became a big problem (helping to cause the famine earlier in the century). It was also nice that the memoir did not end as many immigrant stories do with a triumphant arrival in the United States, with a kind of sense of salvation simply because she escaped a horrible past. In fact, she seems very much to cherish her childhood. For Liu, the choice not to end with her arrival in the United States may simply have been because she did not immigrate to the United States until she was an adult to work as a research scientist, and she wanted in this memoir to focus just on her childhood in China. However, she does end the memoir with a comment that her parents survived through much adversity in order to make a better life for her and her sister, and in much the same way, she hoped to create an even better life for her daughter. I finally got around to reading Jon Pineda's debut collection of poems Birthmark (Crab Orchard Review & Southern Illinois University Press, 2004) after reading his second collection The Translator's Diary, his memoir Sleep in Me, and a young adult novel Apology. Birthmark was published as part of the Crab Orchard Poetry Series. The boy understands the word mestizo. It means "half-breed,"
when he is angry. . . . The distancing of the speaker of the poem in time and in point of view suggests both an inability to address certain issues directly and the possibility of seeing individual experience as something belonging to others as well. Are you there? It's me, pylduck. My eyebrows are starting to be more unruly and to poke out all over the place, too. Is this what it means to get older? So the vet says to me, "I want you to think about trying Giles on a hypoallergenic diet." She explained that it would involve strictly feeding Giles ONLY the prescribed food--no dog treats, no human food, absolutely nothing else--for eight weeks. I looked at her skeptically and told her that it is hard for us not to feed the Giles little bits of all kinds of food throughout the day. She acknowledged my concerns but persisted in explaining that she thinks it's the best course of action to try to deal with Giles's allergies without the periodic regimen of steroid pills, antibiotic pills, and antifungal/antibacterial ointment (he is now on all three of these meds). As she is explaining all this to me, she keeps feeding Giles treats, and when she's giving him what is probably the tenth biscuit, she laughs at herself and says, "I see what you mean about the difficulty of keeping food away from him." So the other day, a colleague mentioned that his students described me as the professor who always talks about his dog. This is surprising to me since I don't feel like I really talk about Giles that much in class. At least it is a pleasant surprise. There are worse reputations to have. I find myself in the midst of the Obama baby boom. In the past month, I've been to two baby showers. In the past week, I've run into two professors at my school (who started the same year I did) and discovered that they are pregnant. I keep cracking/popping my wrists lately since I started lifting some weights again at the gym. They feel tight all the time now. Is it bad to crack joints? Oh, aging.